"I am happy to make you breakfast, I am happy to drive you in your car, which is probably stolen, to my motel. I am happy to make you a sandwhich, but sewing human flesh is where I draw the line." If there were such a thing as the "stupidity hall of fame," I am quite positive that the script for When Strangers Appear may well have a featured place. Never before have I seen a film in which every character is so oblivious to everything around them. On a deserted road, a car parked directly behind our heroine is unnoticed until a startling moment. A fight amidst a flood of gasoline is harmless to one but deadly to another, even though the two are separated by inches. And in perhaps the most ridiculous moment, a dead body sits inches from our heroine in a in a station wagon and she is oblivious, not only to the body (which is in plain view) but even the smell. Beth (Mitchell) owns and manages a sideroad diner and motel in Oregon, where business is slow and she doesn't get much company. One morning, she is visited by a stranger named Jack (Watson), who looks to have been beaten and is bleeding from a stab wound. Feeling sorry for him, Beth offers the stranger a free breakfast and the two strike up a nice rapport. Soon, three men (Lucas, Blick, and Wilson) are also visiting the diner, and Jack is convinced that they are after him. Unsure whom to believe, Beth takes Jack in, but soon doubts his innocence. She falls in love with Peter (Lucas), even though he also may not be what he seems. Add to all this the the town sheriff (Anderson)—who may or may not have raped Beth, and is perhaps the most idiotic sheriff in film history—and his embittered wife.Some have compared When A Stranger Appears to the classic thrillers of past years, though I can't possibly see how anyone can mention this film and Blood Simple in the same breath. Strangers is an overlong, uninteresting thriller that seems as by-the-book as one can get. Director Scott Reynolds has an interesting visual style to be certain, yet it is in his screenplay that he begins to let things fall apart. Events happen off camera that need to happen on camera, and other moments are telegraphed well before they occur, thus losing any sort of suspense. The screenplay also does a poor job of developing its characters. One moment in which one of the lead actors savagely beats a police officer seems out of place, and in the next scene we are expected to care for him and hope he survives. Other moments, including an unnecessary subplot of an angry wife yelling at, then apologizing to, Beth, seems to serve no purpose whatsoever. I have hope for Reynolds as a director, but his screenwriting skills could use some work. The cast, led by Australian beauty Radha Mitchell, is most certainly a mixed bag. I enjoyed Mitchell's performance, though in several scenes she seems almost comically over-the-top. It is in her facial gestures and subtle movements that I found pleasure in her work; in one scene all she does is light a cigarette, but shows so much potential it is unbelievable. 7th Heaven star Barry Watson plays Jack a bit too understated; I kept wanting his performance to become more vibrant. Finally there is Josh Lucas, perhaps a familiar face to some, who gives an over-the-top performance that is so deliciously evil that I found myself becoming more attracted to his character than I did our male hero. Image Transfer Review: When Strangers Appear is presented in both a 2.35:1 anamorphic widescreen transfer, as well as a severely cropped full-frame transfer. The widescreen transfer is generally good, though some scenes show excessive grain and a bit of softness. Indoor shots seem to hold a little more brightness than others, though this could be a filmmaking flaw and not a disc problem. The countrysides of New Zealand (doubling for Oregon) look terrific, especially when the sun is beaming across the land. Sharpness and detail are fine, and little edge enhancement is noticed. Audio Transfer Review: Presented in Dolby Digital 5.1 and Dolby Surround, When Strangers Appear fails to offer a excitement, but for the most part it is pleasant. Surround use is nearly dormant, aside from a few ambient effects, as well as some activity in the climactic action sequence. Music sounds full and rich, creating a pleasing soundfield, and dialogue is crisp and clean with no distortion. Extras Review: Filmographies for Mitchell, Watson, and Lucas are available via the special features menu, as are trailers for this film, I Know What You Did Last Summer, I Still Know What You Did Last Summer, Urban Legends, and Urban Legends: The Final Cut. Each is shown in anamorphic widescreen with Dolby Surround. 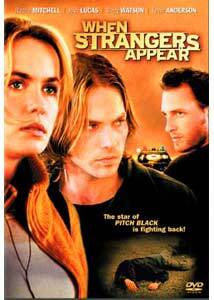 When Strangers Appear is reminiscent of the type of film that you might find late at night on cable. Watching it there, I might find some room for a guilty pleasure recommendation, but as a purchase and a high price tag ($26.98 in some places), I can't.